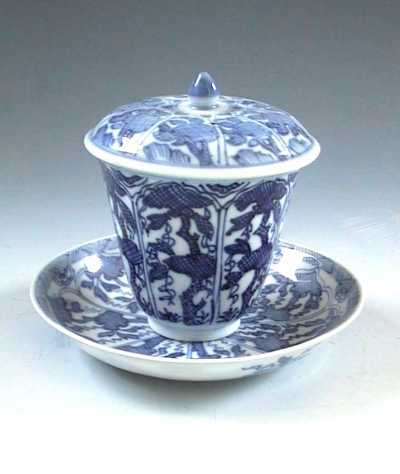 This underglaze blue and white teacup, with dish and cover, is from the Qing dynasty, Kangxi (1662-1722) period. Its base marks are on the cup, a lotus flower and on the dish, a "double fish" mark. Its height is 10 cm or 4 inches with the lid on. Why this small cup has a lid, is a story of its own. During the first part of the 18th century drinking tea came into fashion in Europe. The reason was the poor quality of the water in the cities of this era. The rivers, moats and canals served both for washing, for drinking - humans and animals alike - and as sewers. The burgers in the 18th century city of Gothenburg actually went thus far as to complain to the city fathers about the local beer - which was found to have lumps in it. It was made with water straight from the city central harbor canal. Then the rumor reached the noble rulers, that the Chinese "had a wonderful medical herb that prevented these deceases". The only thing to do was to add some of this into boiling water, put a lid on, and let the power of this herb infuse into the hot water. Drinking this brew would then prevent from illnesses, and the price of tea was set accordingly as equal to gold. This practice upset the Swedish founding father of scientific investigations - Carl von Linneaus. "There are hundreds of Swedish herbs that would work perfectly as good as this foreign tea drink, that threatens to drain our country of funds" he bellowed. In a way Linneaus was right. The fact is, that probably any herb would do as much good as tea in this medical respect, since it actually was the boiling of the water that made wonders with the bad water. But, may no shadow fall on our Founding Father of Science. This was long before bacteria was was to be discovered and in the meantime there were a splendid market for tea and, imported Chinese teacups with or without lids. Came to think of it, the British doesn't seem to have figured this out yet.